Do you plan on spending less during your retirement? Spend less? … or comfortably maintain the lifestyle you’ve worked so hard to accomplish? Travel less? … or have the freedom to just pick up and go? Be less active? … or tick off “to-dos” on your bucket list? Our baby boomer clients dream big when it comes to how they want to live their retirement. If you’re like today’s retirees and future retirees, you have a healthy outlook on life and want to cherish your golden years. It’s important to focus on putting a guaranteed income stream in place––income that you can depend on throughout your retirement. An annuity that provides guaranteed lifetime income might be the answer for you. More than half of all retirees suffer penalties for filing early for Social Security, before full retirement age, reducing their yearly benefits by about 8 percent. Baby boomers incorrectly predict that they can rely solely on Social Security, which only pays for about 40 percent of most retirees’ needs. The average Social Security check is just $1,200 per month! Don’t be fooled into thinking you will spend less money during your retirement years. Knowing exactly how much guaranteed lifetime income you’ll enjoy in retirement is an important step for proper retirement planning. As annuity experts, we can help you put a retirement income strategy in place that helps you live the way you see yourself living in retirement. 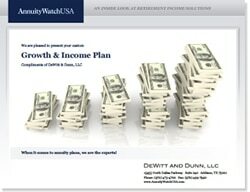 Request your free Growth and Income Plan today…and take the guesswork out of retirement income planning! Find out for sure what kind of guaranteed lifetime income an annuity could provide to you.Simply click here to receive your Growth & Income Plan.